Casa Borboleta is a first floor apartment on Monte Dourado with country and sea views on the horizon. This is stylish 2 bedrooms and 2 bathrooms property, close to the centre of Carvoeiro. There are two communal pools in front of the apartment (plus use of 4 others on Monte Dourado), 2 tennis courts on site, and beautiful Carvoeiro beach is only a few minutes walk, as are a large a selection of bars, shops and restaurants. On entry into Casa Borboleta consists of two spacious bedrooms. The first is a twin bedroom, the second is a double bed with views to the sea and air conditioning, both have large wardrobes with a safe in one. A shower room and a bathroom with shower over the bath, a fully equipped kitchen and lounge dining area with FTA TV, DVD player and log fire, there is also air conditioning available in the lounge. 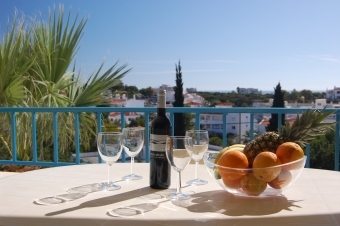 From the lounge is a balcony terrace with stunning views of Carvoeiro and the sea. There is a table and chairs which allow you to enjoy your breakfast and the views at the same time. All linen and towels are provided except beach towels.